These days bourbon seems to be reserved for cocktails or gooey desserts, but adding it to a pasta sauce makes for an unforgettable dinner too. Every so often when I go out to eat, I’ll see several different entreé options that sound intriguing. Unfortunately since I only have enough room to eat one entreé (plus dessert), I’m forced to choose just one of the three or four options I found interesting. This happened recently while I was on vacation. There was a fried chicken plate, a duck dish and a fettuccini and meatballs in a bourbon cream sauce. Well, if I’m picking between fried chicken and pasta, the chicken’s going to win every time. But the fettuccini sounded so interesting that I was determined to recreate the recipe in my own kitchen. I was amazed at how easy it was to make the sauce. Unlike a thick tomato sauce which takes a good hour or so to make, this creamy bourbon sauce only took about 20 minutes. Adding some frozen meatballs finished off the dish perfectly. Cook the fettuccini according to the package directions; drain and set aside. 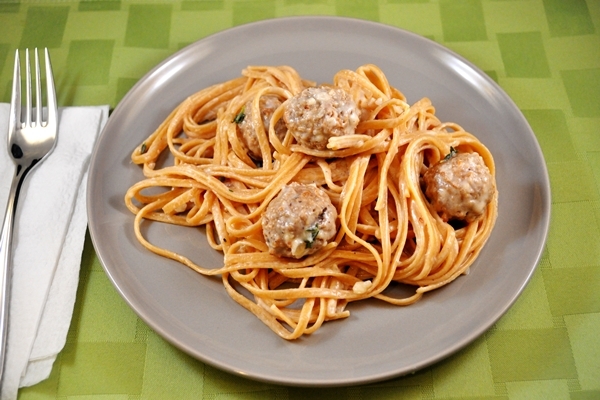 While the pasta cooks, melt two tablespoons of butter in a large skillet over medium-high heat. Add the shallots and cook until tender, about two minutes. Add the remaining tablespoon of butter and flour and stir until a paste forms, about one minute. Stir in the chicken stock, milk, thyme, salt and pepper until thick, about five minutes. Stir in the bourbon and cook for another minute or two. Reduce the heat to low. Add the meatballs and simmer until heated through, 15 to 20 minutes. Pour the sauce over the fettuccini, toss to coat and serve immediately with a nice crusty bread.